ZJ15CT trailer-mounted drilling rig is a kind of economy type trailer- mounted drilling rig that designed and manufactured using the mature technologies of light duty truck-mounted drilling rigs. It is fitted with reliable diesel engine and transmission, 111.55' (34m) telescoping mast, double wheel three-axle semi-trailer. Several patent technical designs and configuration, such as double fast line, hydraulic caliper type auxiliary brake, are optional. 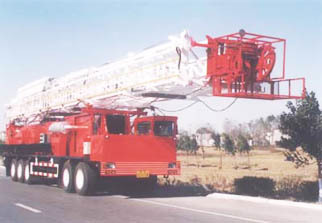 The rig has following features: reasonable layout, low cost for mobilization, easy site installation, reliable operation performance, and easy maintenance. The rig suits short operating cycle, frequent mobilization drilling operation of shallow well within 4,920' (1500m) and workover service within 9,840' (3000m).